rec. live, Big Hall of the Leningrad Philharmonic Society, 20 Feb 1957 (1); 30 Sept 1960 (2); 24 may 1964 (3); 28 Jan 1977 (4). Ex-radio broadcasts; mono ()1-3; stereo (4). Mravinsky, a great friend and champion of Salmanov characterised his music as "gentle evidence of the age that begot him". Apart from these symphonies and the first volume of his string quartets I am not familiar with enough of his music to know how true that statement is. However, I’m sure that a composer such as Shostakovich might have railed against the use of the word “gentle” as being something of an insult, implying compliance, in a country where composers were required to toe lines they often found at odds with their conscience and who sought refuge in a private musical world where they could set out their real thoughts, fears and anxieties, not to say criticism, in ways they left the public to decipher … which they invariably did. Salmanov was certainly one of many composers whose entire life was spent living in a strange world where art was considered a servant of the State and where they did not have free rein over their artistic responses but had to tailor them to fit in with the State’s requirements for music that roused the people to support their leadership and spur them on to greater efforts on its behalf. That is not to say that when “push came to shove” they did not feel patriotic towards their Motherland and its people. Genuine feelings propelled them to produce music that inspired the population at the time or later reflected their experiences. Almost all Soviet composers, Shostakovich included, responded that way at times. Salmanov’s first symphony falls into that category, representing as it does his reaction to his wartime experiences. This work was conceived as one that showed the onslaught against all Slavic people, using as it does in its opening a Slovak folk tune and Czech and Slovak folk songs in its finale, and the resistance and final victory of this united people over the Nazi war machine. The first movement is powerfully expressive, full of crashing climaxes and walls of orchestral sound while the second is in complete contrast reflecting upon the fate of the nation and life itself in a much more subdued atmosphere until it nears the end when we are reminded of the situation. The finale sums up everything that has gone before. The folk songs woven through, in broad sweeping passages and ending with a grandiose rendering of the folk song element show how these united peoples overthrew a common enemy. With the four works on these discs recorded over a period of twenty years the sound is bound to differ considerably. Given that the first symphony dates from only twelve years after the end of the war, with the production of musical instruments a low priority and those at their disposal the worse for wear, this first sounds muddy at best with some notes somewhat off the mark. However, in a perverse way, given its ‘programme’ this rather strangled sound is all the more telling, even accentuating the music’s poignancy though it is surely time this first recording, in common with the rest, all of which have been released before, was given a modern one that benefits from new sound technology. From its dedication to Shostakovich, a man Salmanov much admired, to its movements’ titles, Song of the Forest, Call of Nature, At Sunset and ... And the Forest Sings, one might imagine that the second symphony would be in the mould of Shostakovich’s Song of the Forest which was a work that fell into the category of regime pleasing fodder - though I must say I still like it. However, it is nothing of the sort although the first movement is a gentle enough evocation of the forest with its natural grandeur and majesty. The booklet notes describe the two central movements as reflecting the unfolding of a human drama and the second certainly has an overtone of anguish while the third begins starkly with the clanging of bells and the crash of an anvil as in a warning. Despite its title At Sunset it is marked Allegro molto e feroce. With the bells joined for a moment by a whip one can only imagine what kind of drama the composer had in mind. The music calms for a while but then becomes agitated again with more use of bells, xylophone, plenty of brass and another whiplash as the movement ends. The finale begins in subdued mood though there is still an anxiety being expressed and the work ends somewhat inconclusively. Salmanov held several music related quasi-governmental postings such as Secretary of the Union of Composers and as a result some have sought to bracket him with the notorious Tikhon Khrennikov. Anyone who thought the same way as that man would never have dedicated a symphony to Shostakovich whose work people like Khrennikov were at pains to criticise. 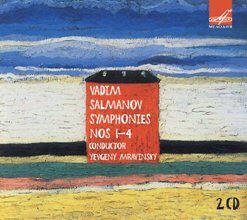 Salmanov’s third symphony is dedicated to the memory of his mother. It is surprising that it should be the one that he chose to treat as an experiment in twelve-tone serialisation and several other ‘contemporary’ techniques, particularly in its first movement that has tension at its heart for much of its length. The second movement, however, is lyrical in nature with some moments of especial beauty while the third with its use of woodblocks gives a spectral impression, furtive and eerie by turns. With the final movement there is a return to lyricism though not without an underlying current that is anxious and disturbed, particularly in its central section. The ending is quiet if baleful. Each symphony in terms of audio quality gets better with the passage of time and with the fourth symphony we are in the late 1970s with full stereo at last and with instruments and technology a far cry from those the orchestra had to contend with for the first. The first movement of this three movement symphony is almost as long as the other two combined and is full of power and beauty. The second is a total contrast with real Shostakovichian overtones reminiscent of his ballet suites with their circus romping, skylarking and clown-like atmosphere. A call to order is sounded with bells and an ominous peace is restored momentarily before restless strings burst forth signalling a return to buffoonery. The last movement opens with woodwind and the odd note from a xylophone followed by an impassioned violin solo heralding considerably powerful waves of orchestral sound before a plaintive flute sounds. This gives way to an elegiac conclusion that ends abruptly in silence it being the only time the applause of the audience was not included. This symphony ploughs real depths of emotion making it very affecting. The more one hears it the more I’m sure it will grow on one. I think it is my favourite though the others have much of interest within their pages. Salmanov was not a great composer but neither was he insubstantial; he had much to say and whether it was setting down his emotional response to the Second World War or deeply held thoughts on life itself he found ways of expressing them that raise his music above the level of the average Soviet hack or apparatchik crony. Anyone who enjoys exploring the composers who worked during Soviet times will find much to admire here. Mravinsky was renowned for drawing out impassioned commitment from orchestras in his recordings. These are no exceptions despite the ‘ancient’ sound in at least the first two. These recordings were all world premières but how many times are they going to be re-released - this must be the third time - with a stilted and at times incorrectly translated brochure that gives insufficient information about Salmanov. It is time that the Russians at least (how about Gergiev or Petrenko?) gave these symphonies modern recordings. Who knows, these people could reveal new levels within the music that haven’t been heard before.